I have just moved the many raw files to my workstation. We are ready to start assembling the bracket groups into single tone mapped TIFF images. TIFF (originally standing for Tagged Image File Format) is a file format for storing images, popular among graphic artists, the publishing industry, and both amateur and professional photographers in general. To learn more about this format, click here. As I mentioned before, I use Photomatix Pro. Ferrell does a good job comparing all the major players in the tone mapping software world and overall, Photomatix comes out on top. I won’t rewrite what he has already done a great job with as far as detailing the Photomatix workflow. You can read it in his book for yourself. But we can at least look at it from a higher level to give newcomers a better idea of the process. 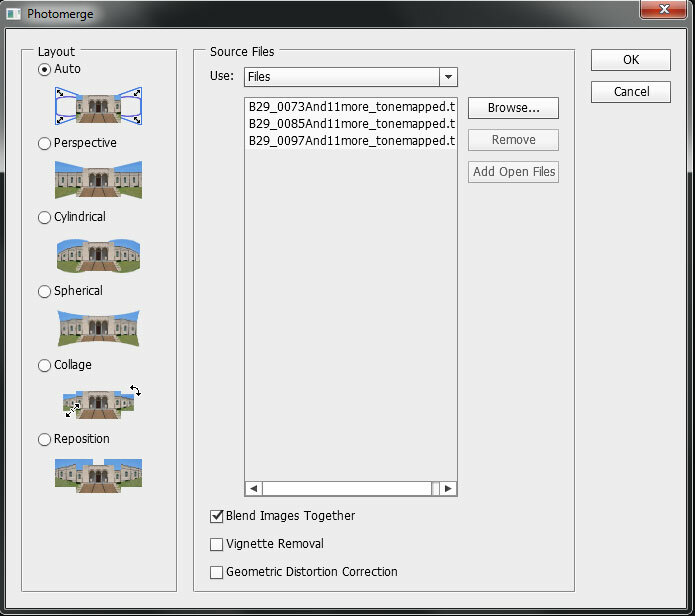 Photomatix essentially merges all the light detail from each exposure that you give it to process, and combines or merges everything into a single image. After the merge, you can then control the different aspects of the image, including highlight and shadow saturation, smoothing, white/black points, strength of the effect, etc. It’s up to you to decide how much or how little you want to apply to the image. I typically start out by selecting one of many presets (of which can be found on the Internet… some are free and some are paid). Usually one of the presets will put me close to where I want to take the image from a mood perspective. I can then use the sliders to fine tune the image until I get it to almost where I want it. Tone Mapping involves taking many different exposures of the same subject and merging all the light data into a single image. I prefer Photomatix Pro to handle this process as it results in the fewest anomalies. Once I am happy with the overall results, I save the image as a TIFF. If I was doing just a single frame instead of a pano, I would immediately open it in Photoshop for fine tuning. But in this case, we have more frames that need to be Tone Mapped and saved as TIFFs. So I repeat the steps as mentioned above for the remaining three frames of the pano. Because I know I have other Bracket Groups to process, I also take the settings in Photomatix and save them as a Preset. This way, I make sure that all the groups are processed the same, thus assuring visual continuity. By default, Photomatix will have the settings set to however they were on the last processed image, so long as you don’t close Photomatix. However if you save the Preset, you always have the option to go back. 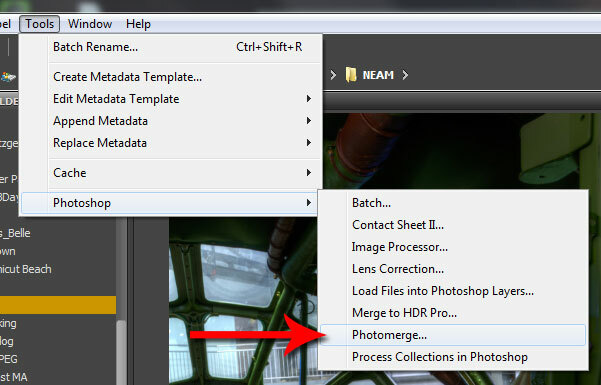 Make sure to save your Photomatix settings for easier processing in the future. 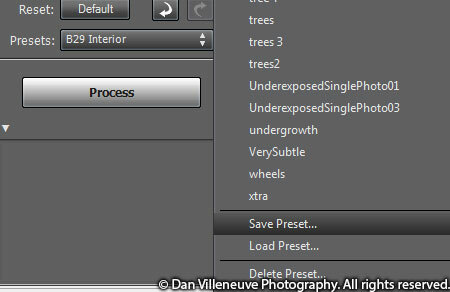 The Save option is at the bottom of the Presets selector in the Edit Panel. Now we get to see just how well we planned the frames for stitching. Photoshop is usually pretty good with being able to fit, or stitch, multiple images together to make a panorama. Sometimes there are little continuity glitches that need to be fixed, but usually those are fairly straight forward edits using some careful application of masked layers, the clone stamp and the healing brush tool. The first part of this step is to select all the TIFF images that we saved from the Photomatix Tone Mapping Process. I use Adobe Bridge to manage my images. So I CTRL-Click each of the TIFF images to select them. 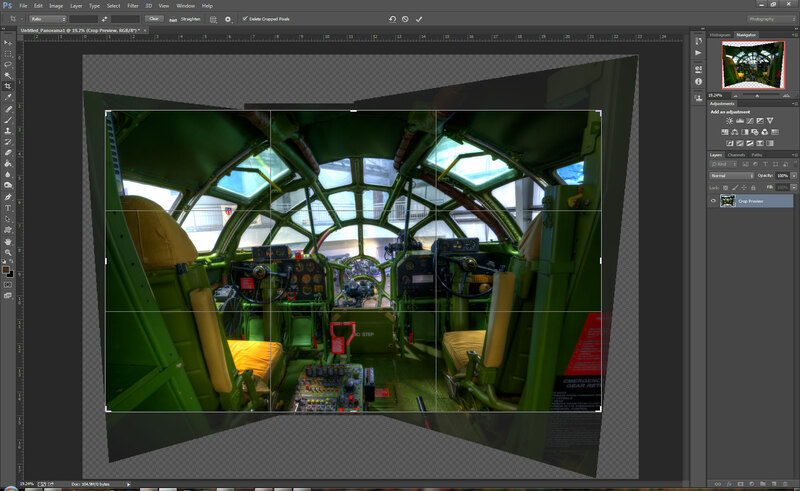 From there, I select the Tools > Photoshop > Photomerge… option. 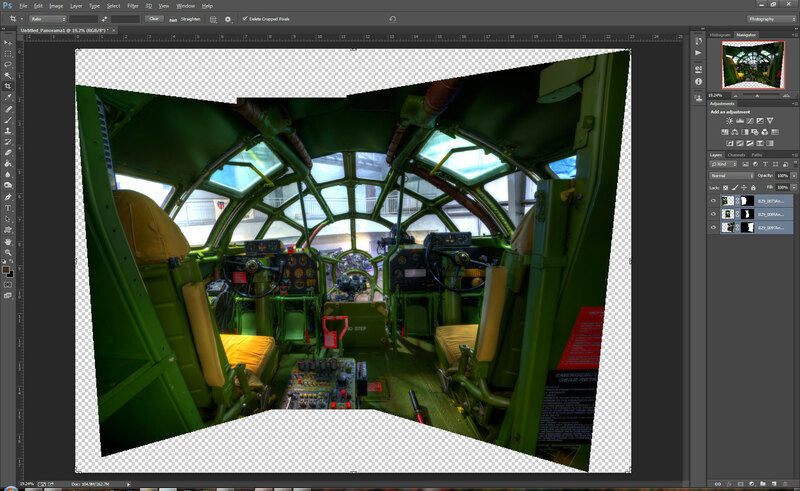 Selecting Photomerge from Adobe Bridge starts the stitching process. This will cause Photoshop to open (if it isn’t already running, it will start automatically). Next you will be prompted to select how Photoshop will handle the stitching. This is the Photomerge dialog in Photoshop CC. In most cases, I take the default of “Auto”. However, sometimes I do find it is better to select one of the other options. Same thing goes for the “Geometric Distortion Correction” option. You just have to play with the settings to see what works best for this particular group of images. The final merged result in Photoshop CC. I’ll then merge all the layers to a single layer (Select all the layers and do a CTRL-E). This will make the remaining editing easier. While very interesting, this result isn’t going to allow us to have a nice clean image because of the odd shape. So we need to crop out the extra image parts that won’t fit nicely into a single, printable image. Use Photoshop’s Crop tool to remove the excess. Use the Crop Tool to trim the excess parts of the image which won’t translate well into a print. Run a noise reduction pass. I use Neat Image’s Photoshop Plug-in for this as it’s pretty reliable. With HDR’s, you really need to apply noise reduction liberally as HDR has an inherent tendency to vastly bring out noise. This is especially so with fewer numbers of exposures that you use during the Tone Mapping process. So not only should you use Photomatix’s built-in noise reduction, it’s in your best interest to use another NR pass in Photoshop. One of the beneficial side effects of all this noise reduction with HDR’s is that it helps to give a slight painted or watercolored feel to the image that I like. Apply a Pre-Sharpening pass. Every lens on the market has some sort of “softness” of which there are countless ways to address. My prefered method can be found in Martin Evening’s book, “Adobe Photoshop CC for Photographers: A professional image editor’s guide to the creative use of Photoshop for the Macintosh and PC” (There are versions of this book that cover older versions of Photoshop. I also had the CS3 version before I moved to CC). Martin walks you through two different ways to pre-sharpen an image in such a way that you create a reusable Photoshop Action. I use this Action on every image that I process and it makes a world of difference! Apply any adjustments to help fine tune the lighting. This could range through Curves, Brightness & Contrast, Levels, or Exposure Adjustment Layers. I prefer to use Adjustment Layers because you can then use Layer Masks to selectively apply the adjustment to any particular area of the image. Sometimes doing an overall image adjustment isn’t what you want. This lets you pinpoint the fix. The last thing I usually do is to manually fix any chromatic aberrations that come from my lens. These can be really subtle on a normal image. But once again, HDR processing will exacerbate any flaws, especially fringing from chromatic aberrations. When zoomed out, these usually are minor. But they’ll be noticeable when the image is printed. So it’s best to spend the extra time to fix these little buggers. Fringing occurs along high contrast edges. Most lenses will have this aberration to one extent or another. After lots of trial and error, I’ve found that I can effectively fix these issues with selectively masked Hue and Saturation Adjustment Layers. 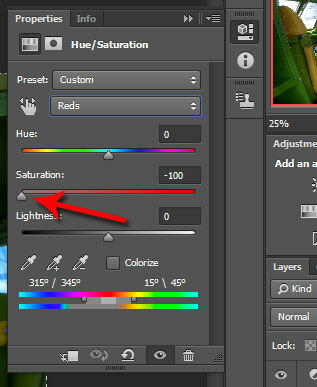 Using Hue/Saturation Adjustment Layers, you can isolate and remove fringing caused by chromatic aberrations. With the Hue and Saturation Adjustment Layer Panel open, I’ll choose the color channel of the offending fringe that I want to correct. Sometimes I’ll have to change the color range a bit using the slider at the bottom of the panel. I reduce the saturation to an acceptable level and sometimes also adjust the lightness to reduce any highlighted or halo effect. Now, out of the box, this will affect the entire image. So I’ll click on the Mask icon in the layer, select my Paint Bucket tool (G), and make sure the foreground color is black. Then I’ll click anywhere on the canvas to apply to the mask. This effectively hides the change. Next, select your Brush Tool (B), and switch back to a White foreground color (X). From there, I’ll paint over the offending fringes and they magically disappear! TA DAAAAAA! Use later masks to apply Adjustment Layer changes to a specific part of the image. Normally you want to be more refined with the mask. In this case I left the mask area big to demonstrate the mask more visibly. Ultimately, it doesn’t hurt anything in this case. Repeat and rinse until you are happy with the results. I do a final save to the .PSD file (you really should be saving often while editing as a general rule of thumb). If I have more images, I like to process them and then do a batch conversion to JPG before I upload to the Internet. C’est fin! So that, my friends, is what typically is involved when I set out to make an HDR Panoramic Photo. If you made it this far through the reading, you have the patience of a saint and my sincere gratitude! I truly hope that this has shed some light on the overall process and provides the guidance that you were looking for when setting out on your HDR adventure. The main thing is to constantly practice and refine your process to work with the tools you have. It’s an ongoing process that offers great reward to those who persevere. I look forward to your feedback and if you have questions, please feel free to ask! This entry was posted in Technique and tagged HDR, panorama, techniques. Bookmark the permalink. If jou start out with -4ev and you want to end with +5ev in jour last bracket, you will have 15 exposures in total. Or do i missread something in the artikel. It really depends on how you set up your bracket, Hans. Most people prefer to set up the stop difference to either 1 or 2 EV. I have been using 0.7 EV (2/3 stop) on my D7100 as of late. The smaller the EV setting, the more exposures you will likely end up with. I prefer the smaller EV bracket settings as it leaves less detail for the Tone Mapping software to interpolate, and therefore less anomalies in the highlights and shadows. In some cases, you might have duplicate exposures, depending on how you decide to work the brackets. It’s not a problem with most tone mapping software. I know that Photomatix Pro accounts for this and allows you to manage the exposure for those duplicates. What truly will dictate if you have the right amount of exposures is your histogram. Your extremes should be peaking at either end of the histogram. If your -EV is not snug against the left side of the histogram, then that is a good indicator that you probably should include another bracket that covers the lower set/shadows. Likewise for the highlights. It takes a bit of practice to find the workflow that works best for you. But once you get something that works, it’s usually a smooth process in the field. Remember that each composition may require some tweaks based on lighting. Dan, once again, thank you for this fantastic tutorial. Sharing your knowledge to help other photographers is a totally selfless act and is so appreciated. A question if I may. I am totally sold on the need to bracket for more than 3 exposures, which has been the way I have done it previously, do you still advocate 9 exposures for landscape photography, or would say six suffice? Cheers Dan. I don’t use the same number of exposures every time I shoot a bracket group. The reason is that lighting will change from one subject to another. I use the histogram to guide me as to how many exposures I should take for any given composition. The main goal is to start out with your first exposure being as far into the Shadows (Left side of the histogram) without clipping, and your last exposure being as far into the Highlights (Right side of the histogram) without clipping. If you haven’t gotten to the Highlights enough, then take another bracket after adjusting your base exposure. The total amount of exposures will then depend on what increment you’ve set your bracketing to adjust to; 1/3EV, 2/3EV, 1EV, etc. I’ve seen some photographers set their bracket adjustment to +/-2EV and swear by it. But I’ve had interpolation issues in Photomatix when I’ve done that. So the most I’ll venture out would be the +/- 1EV. Modern SDHC memory cards typically have plenty of space to allow for the volume of exposures, so other than time spent getting the exposures, there’s no reason I can see not to go ahead with the smaller stop differences. Hope this helps!